Pre-cuts, kits, & fabric by the yard is 10% off. Clear a bolt for 25% off. Not valid with other coupons or discounts. Elna sewing machines & accessories are excluded. Clearance merchandise is priced as marked. 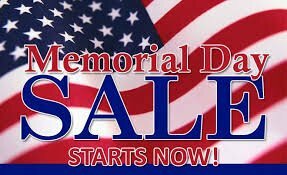 Online shoppers may get the 10% discounts by using the coupon code: MEMORIAL18 at checkout. You may also call us and order by phone. Now through May 31, 2018 you can get 0% interest for 48 months on a purchase over $2,000. This will be a credit card you apply for here in store. The 0% interest only applies if you do pay it off in the 48 months- you may have to pay more than the minimum monthly payments to pay it off.